As Treasury Bill yields fell during the early 1930’s, Treasury Bonds moved in the opposite direction. 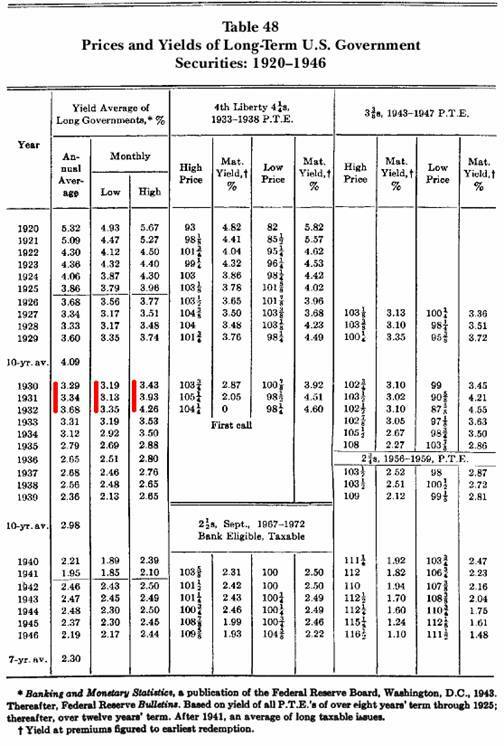 As you can see from Table 48 (also from A History of Interest Rates), Bonds rose in yield (fell in price) during the banking crises of 1930-32. The investment herd is currently engaged in a Bond buying frenzy. They believe that inflation will be low for an extended period. We agree. While we may have inflationary countertrend rises, overall we are in a deflationary environment where banks fail, assets fall and the economy deleverages. However as history shows, government bonds were sold in the deflationary spiral of 1930-32. The excuses were two fold: liquidity concerns and inflation fears. Banks sold bonds (their mortgages were frozen) to raise cash reserves in case depositors decided to withdraw funds. In addition, major government interventions at the time (sound familiar?) caused a fear of long term inflation. The dumping of Treasury Bonds finally stopped in June of 1932 (the same month as the stock market bottomed). So Bonds depreciated in the historic deflation of the early 1930’s, but is this relevant today? The current bull market in Bonds has lasted since 1980. But only recently has the Treasury Bond market registered a record extreme in bullish consensus according to MBH Commodities' Daily Sentiment Index. Now for the first time in 28 years, 99% of traders believe the upward trend will continue. Remember when everyone thought real estate could only go up in value? At this point, the Treasury Bond market is swaggering around, certain of its own opinion that it cannot fall. Politicians are trying to inject confidence into markets by bailing out certain institutions, industries and/or groups. 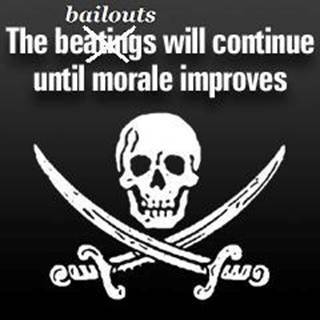 Instead bailouts are having the opposite effect, dividing the country into bailout recipients versus everyone else. Folks here in Alabama are incensed. Slicing up society does not improve confidence. So why even contemplate this type of policy? Politicians love Keynesian economics (which rationalizes government spending and bailouts) because it allows them to enrich their friends and supporters. They rely on the Broken Window Fallacy to hide the true costs of bailouts. But Keynesian economic theory is a disaster for the economy. Average Americans (and their children) will pay for bailouts through higher mortgage payments, currency devaluation, unemployment and higher taxes. This is the difference between a quick blowout and a long depression. “Deflation is a great liberating force because it destroys the economic basis of the social engineers, spin doctors, and brain washers.” - Guido Jörg Hülsmann, Deflation and Liberty. So what can we do to minimize the damage? Please get involved with the non-partisan Peter G. Peterson Foundation that is pressing Congress to address the national debt. They have recently released a free 30-minute clip of their documentary: I.O.U.S.A. Wall Street will never recommend Treasury Bills. The reason? They can’t make money off of them. Brokers receive no commission (or very little) for purchasing Treasury Bills. Current T-Bill yields are also below expenses for most money market funds. Some Treasury-only money market funds are even closing to new money or completely shutting down. In contrast, we will continue to lower expenses for investors seeking investment management in a low rate environment. Our strategy is to place investor’s interests above our own as we build a different kind of investment firm. The House of Rothschild, a 1934 movie, depicts a major financial panic in London in 1815. Rumors of a British defeat at Waterloo run rampant. Everyone is dumping shares, except for Nathan Rothschild. He is buying. The Panic reaches a climax when rumors of his own failure reach the market. You can see how Rothschild’s contrarian strategy fares on YouTube. Copyright ©2008-9 Lamont Trading Advisors, Inc. Paul J. Lamont is President of Lamont Trading Advisors, Inc., a registered investment advisor in the State of Alabama. Persons in states outside of Alabama should be aware that we are relying on de minimis contact rules within their respective home state. For more information about our firm visit www.LTAdvisors.net, or to receive a copy of our disclosure form ADV, please email us at advrequest@ltadvisors.net, or call (256) 850-4161.